When anointing an offertory candle with Road Opener Oil, do you go up or down? You are removing obstacles, but at the same time you are opening the road, so that's why I'm not sure whether to go up or down. Star_Princess: I have heard different people do it each way for the reasons you noted. I personally work from the base up to the wick to bring new chances, new open roads, and concentrate on what will open for you after removing the obstacles. I have seen workers who will go from wick to base and concentrate mainly on removing the obstacle before concentrating on the Opening of New Roads. Since you are doing the spellwork for yourself, how do you feel about it? Well, I wasn't really sure which direction was the right way to go, because you're removing obstacles and opening up new roads at the same time. Could you do both, like go from base to wick and then annoint the candle again and go from wick to base? Or just do one or the other? So in other words, either up or down is ok? Star_princess, your question is an interesting one, given the nature of Road Opener, but you are also getting into an area far beyond what can be described in simple terms in a thread about how to use this oil. You see, the question is not so much about Road Opener Oil (although i know YOU think it is) but about how candles are dressed. Your rules about drawing and repelling (which way is up and which way is down) -- even the concept that all work can be divided into drawing and repelling! -- are not by any means universal rules. There is no central authority in conjure as you might find in other systems of religion or magic. Rather, the entire question brings up other, much more cogent issues of lineages of teachers, regional customs, personal preferences, spirit-led techniques, and book l'arnin'. The Magic Candle by Charmaine Dey. The first came out in the mid 1930s, the next two came out in the early 1940s and the last one came out in the 1960s. All four of them show differing ways to anoint an offertory candle with oil -- including up, down, half up / half down -- and more. You can study with someone like me and i will give you all the details of all the systems and tell you from my experience why and how they work within their own internally self-consistent modalities, but i have no intention of promoting one rule-set in this forum. Thanks Miss Cat and Jwmcclin for the information. I will check those books out that you listed, very informative. It seems like Van Van and Road Opener are very similiar to each other and both are for the same purposes, so how would you know which one to get (Van Van or Road Opener)? I don't see Road Opener as all that similar to Van Van, nor do i use them for the same purposes. I know that what goes into them is different, and my intention when i make them is different. Road opener removes blockages. It unlocks doors and puts an end to delays. It pushes aside those who stand in the way. It clears a path. Van Van cleans up dirty things, and brings freshness and good luck to dank and tedious situations. I have never used Van Van for road opening. I use it as as essentially the oil form of Chinese Wash -- to "clear away that evil mess." and to bring light, airy, tangy goodness to dark musty places. Yes, I read the description for Road Opener and it says to peform the spell during the waxing moon. Thanks Miss Cat for explaining the differences between the two. I thought the two were similiar because someone else on this thread said that Van Van removes blockages. I think the reason why people get van van and road opener confused is because in the Van Van description it says "opens door to new opportunities"
I love van van for refreshing in between readings for each client. Yes Stars, thats the reason why I thought the two were similiar and I couldn't decide which one to get or to do both of them back to back. Can a person use Road Opener oil on the body? I ask because Iv'e only seen post about it being used on candles. Thanks in advance. I'm with cat in regards to the Van Van/Road Opener comparisons. Very different oils for very different situations. live. He's a friend of mine and he lives in Massachusetts and I live in Kansas, so this will be a long distance oil work. What should I do? Also what other oils I can buy to make him move?? Could you give me ideas though on what would I do to make someone move to my state specifically? Like a spell? Thank you! But should I use the kit or oils and put dress them on a candle and do a petition paper? EmmieB: As Miss Cat has suggested in her reply above, you should get the Come To Me Spellkit, as well as the Road Opener Oil. The Spellkits all come with instructions on what you should do to work the spell successfully. What herbs to use with a Road Opening oil to unblock my life? Please let me know. Thank you. 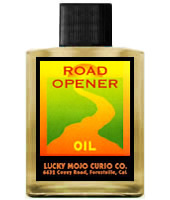 First off, Lucky Mojo brand Road Opener Oil comes with herbs right in the bottle, so you don't need to add any. In fact, plenty of people kinda fish the herbs out with toothpick to use them alongside the oil. Second, if you want to know how to use herbs, and to look at lists of herbs grouped by their uses, you ought to get a copy of my book "Hoodoo Herb and Root Magic." We sell it in our catalogue, on the books page. I am having a situation which I discussed more in depth, in the FWP thread. I have applied for a Section 8 apartment, as I can not get a job while living in the house that my MIL owns & pays for. She will not allow me to let my 15 yr.old stay at the house, unless I'm there. Anyway, I saw the ad for these places in teh paper so I'm pretty sure they have units available. To add greater insult to injury w/my situation, the water pump went out on my car & I can't get it fixed until after I get the place. I made the mistake of telling my husband that I had the taxes DD'd into my bank account, so his mother ended up getting involved & I promised her that I would give what was left after fixing my car, to shut them up. The whole reason I'm taking the large refund is because a) he will spend it on drugs, b) I need the money to get me & my kids out, & c) I can't trust her not to give it to him anyway! It was VERY obvious that he was shooting dope a couple of weeks ago & she STILL handed over $5,000 to him, because she felt bad that I won't let him back in the house & he wouldn't go to her house when she gave him the ultimatum to quit calling her names or leave, & his dope whore put him out because he was acting paranoid & scaring her. That is an entirely different can of worms though. The headline is that I need this apartment yesterday! Then I can get my car fixed & feel safe again, as I'll be abe to set up a dummy address to keep him away. All I have at my house is a few candles, RO oil, Crown of Success oil, & Crown of success incense. Should I write my petition & burn the incense with an anointed candle (RO/Crown of Success oil) that I've carved the petition into? Also, would backing it up with LM lighting an RO vigil on the church altar make it more powerful? Thank you. I will follow my intuition & have MISC set that Road Opener candle for me. I recently bought some Road Opener oil that I am planning on using as a component to some work I want to do to help me find a new job. The original plan was to use it to dress a seven-day candle along with some success herbs, but after reading more about the oil and how it works, it seems like a better idea for me to use some High John oil (which I'm in the process of making, with some LM High John root chips ) on the candle. In retrospect, it would have made more sense to go with Steady Work or Crown of Success. However, due to budget constraints, I thought Road Opener might be more useful to me as it's a little more versatile, especially since I am also preparing to apply for the Phlebotomy program at my school, which I may have some trouble getting into due to some legal issues I've had in the past year and a half (marijuana possession and a DUI, both misdemeanors). Incidentally, the legal issues are the main obstacles I want to knock down in order to find a better job. I'm thinking of, after doing the candle work, anointing my body with it when I go out to apply to jobs, as well as interviews. Is this a good use for it? If so, should I anoint my body from top to bottom to clear away obstacles, or should I anoint from bottom to top? I've been practicing magic since my early teens, but I am fairly new to rootwork. However, the few Hoodoo-style workings I've performed have been very successful, so I know I can make this work. I would just like to know that I am doing things properly and educate myself before attempting anything. Thank you, Miss Aida. I have LM Steady-work sachet powder and a stash of herbs to do this, so I think I'll be good. Also, would Road-opener be a good product for ridding yourself of writer's block? I'd really like to start writing again and, if possible, make a career out of it. I don't know of any LM products that are specifically for stimulating creativity, but I figured a combo of Road Opener and Crown of Success would be a good start. Does anyone else know of products that are made for this purpose? Road Opener and Crown of Success would work well together for writer's block. A bit of Clarity or John the Conqueror might also be a good choice. Hey guys. I just finished my Road Opener vigil lighting and I must say... Things for me are seeming to get worse! My empathic friend whom does my readings can not figure out why this is happening right now because she saw things getting better so my question is... Is this normal? This happened one other time to me on New Years Eve 2012 entering 2013. I'm sorry I haven't read all your replies but have you done a reversal/protection/uncrossing spell/bath/ritual all of the above? In saying that sometimes things seem to get worse before they improve to move your situation to where you want it aligned. As a broad example or two, you want better money in your job, so you lose your job inly to walk into a better one with so many more benefits that you love even more. Or if you are trying to breakup/reconcile with someone, they move in with a person and realise it is so very very wrong and come hurtling back to you. I have seen these type of things happen before so I hope this may give you hope. Thank you for replying and I think where I still need work is doing full blown uncrossing work. I actually just did a uncrossing bath but perhaps I should've lit a vigil along with it to really give it tge extra UMPH. The situations I'm dealing with is gonna take some time so I'll keep trying till I can't no more. TheBestest, yep, Uncrossing is exactly what I would suggest. A 13 herb bath is never going to hurt and anytime I feel off, uncertain, or concerned that something isn't quite right I do a 13 herb bath. Also, you might want to set up some protections for yourself. Make sure that you are cleansing your home as well as your person. Burn some protection candles or do a more formal ritual/spell for protecting your home. This will help to keep the cleansing work last longer and get you back on track. Hey all! I read someone once say that they light Road Opener Vigil lights every month. Is this necessary or can I just work with that every other month? I did Road opening this month and also did some Uncrossing, so is thid necessary? ''Is it necessary?'' is one of those questions like ''Which spell is strongest?'' It's necessary if your situation calls for it, otherwise no. Do you need a steady stream of blockbusting right now? Have the roads opened up? Answering those questions will help you ascertain if it is necessary or not. You work until you get satisfaction. If you've uncrossed and the roads are open, then try some drawing work to bring in what you need. Would road opener be appropriate to remove emotional blockades such as mistrust or hurt? and Road Opener for clearing the path for a relationship/situation to develop. I agree with Colette. In order for stable emotional bonds to form in the future, we've got to heal the emotional wounds of our past, then open the roads for new opportunities which we can approach from a place of wholeness. Blessings to you! I often successfully use LM Fast Luck Oil to add some speed to a spell. I was wondering if it is traditional to use LM Fast Luck Oil with LM Road Opener Oil for the same? I would greatly appreciate your expertise! Its a matter of personal choice on this one Genies_Lamp. Thank you for your response jwmcclin! Sorry for the delay, as I was having the whole ip blacklisted issue and could not respond. I think I got it fixed now though. I have been working on changing my mindset to attract more money and a job. However, things aren't really picking up as I hoped. I ordered road opener, fast luck, attraction, and prosperity oils. Should I use the road opener first by itself for a day or can I use all the oils together? I need things to happen quickly because my finances are really in a hole. I would use the Road first and by itself. Now this is just me but that's the way I do it the majority of the time. Thanks Miss Aida. Should I use it alone until I see something happening? That would be your choice. But personally look at candle wax symbols to see if I need to do it again or if I can move on. Just a general question - I know Road Opener opens new opportunities, but can anyone tell me what would compliment it? I'm thinking of moving to a new city, but I feel like there's a lot of obstacles in the way (new job required, apartment search, etc). Can anyone tell me what oils would compliment road opener? A luck oil would help. I like van van which is a good all around as well. If you plan to move I would order a bottle of chinese floor wash to clean the appartment and some happy home incense to cleanse the new appartment and make it happy and loving for you. Steady work would help with getting a job. Look Me Over was originally intended as a love oil, but I have heard that some people have used it successfully in house- hunting. A combination of Crown of Success and Steady Work is just the thing for job hunting. Hello I was wondering if this oil along with a white candle could be used before I work a love spell? But, if you don't have orange then, white will suffice. Perfect idea before working your other spells! My target and I are friends with benefits who enjoy each other's company outside the bedroom. He used to initiate conversation and plan going out for drinks and to his place, and he recently stopped. He's flirty when I text him, and he says we should hang out, but doesn't make plans or say anything I reply with something positive (that could encourage him to make concrete plans). I want him to be proactive again. Would adding Road Opener Oil to a candle dressed with Come to Me Oil help me achieve this, or is it best to have two separate lights? Thanks Miss Aida! I'll be sure to use orange then. Do Road Opener and Block Buster cut through obstacles so that work that has already been done can manifest? In other words, is it necessary to redo vigil candles that had previously burned well after the road opening ones? Blockbuster breaks down the barriers. Road opener leads you to the right roads. Yes, you would have to redo the other candles afterwards because now you are having less resistance. It should make your new spells reach the target easier and cut down the resistance that the target may be having. i bought some LM Road Opener Oil to remove blocks between reuniting with my ex-boyfriend. However, I used for a completely different reason this week and had amazing results.